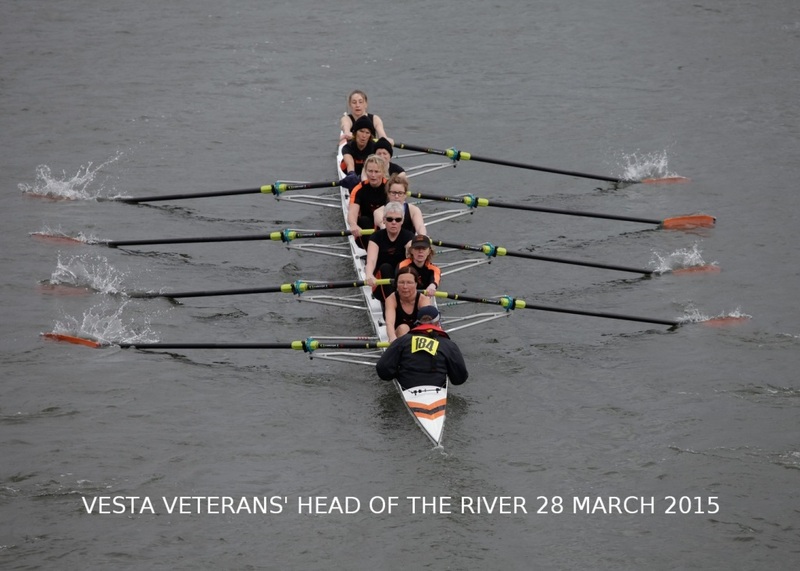 The Champs ladies headed to the Tideway on Saturday 28th March for the annual Vesta Veterans’ Head of the River Race. Taking place over the winding 6.8km of the Championship Course, this race is certainly not for the faint-hearted, with the first test for the ladies coming in the form of the 6:15am coach from Cambridge. Thankfully, this was a challenge that they all rose to, and the “Seahorses” crew arrived on time at the University of London boathouse to meet up with their guest cox, ex-Clare and current Wolfson (Oxford) steersman Edward Mills. The organising team at Vesta had been extremely careful in timing the start of the 2015 race, following the confusion that had marred the results of the previous event. Fortunately, tide times were also favourable to running the full course, meaning that the ladies were to race from Mortlake to Putney; this also prevented any marshalling disasters, as the crew was able to slot into its well-defined marshalling point on time rather than becoming part of a mass flotilla hovering somewhere in the Hammersmith region. Unfortunately, even the best marshalling in the world carries with it a certain amount of waiting time, and so the ladies, starting 184th, had to spend the best part of an hour tucked into the bank and watching crews pass, with only Edward’s dramatic readings of Harry Potter over the Cox-Box for company. Following the excellent advice of their coach Matt, the ladies had agreed on a measured approach to the race, and so once the time came for them to spin onto the start they wound it up to a steady 29. Although they started in relative isolation, owing to some unfortunate-but-necessary de-kitting shenanigans, the crew’s rhythm began to tell early in the course as they slowly ate into the crew from Barnes Bridge Ladies ahead of them. Closing the gap relentlessly, the overtake came surprisingly early in the course, but pleasingly the crew did not treat this as an opportunity to take the pressure off; instead, they continued to open up the gap on Barnes throughout the race. The race-plan as a whole was well-executed, as the ladies stayed on 29 throughout the majority of the course. This rhythm soon began to have another effect: it made a real impression on the crews behind them. Specifically, the all-star composite crew 185, which included another member of Champs and a 1927 BC rower, was unable to make any real impression on the ladies in spite of their pedigree. The final results showed only a 7-second gap between the crews over the 6.8km course, an impressive achievement for the Champs ladies, who had been fearing an overtake before the start of the race. One other notable point of interest in the race came just after the Eyot, as the ladies closed on crew 178, a Bradford-on-Avon Masters ‘H’ crew. The overtake here was clinical, as they moved smoothly from half a length, to overlap, to clear water within 50 strokes. From then on, it was a question of how well the crew could hold on to the finish, as conditions took a turn for the worse around Hammersmith, but timely reminders for length at the front end and exhortations to ‘do it for Rowan’, a sadly-injured crew member, brought the Champs crew over the line at Putney in a respectable time of 22:42.1. This result saw them finish up 29 places, in 155th position, as well as fourth out of eight in the Women’s Masters’ D category. This last result in particular was especially pleasing, representing a significant improvement on last year’s finish of 6/10 in the same category. All in all, the ladies finished the day pleased with a successful Tideway jaunt. This result represents a strong foundation for the rest of the year, attesting to the effectiveness of Matt Lawes’ coaching, and leaves the whole crew hungry for success as the summer dawns!